Hello and welcome to my first Vintage article! Vintage? Why would a Legacy fanatic write about Vintage? I had the opportunity to experience this format a few weeks back at the Prague Eternal event, and did rather well while also enjoying myself, and wanted to share that fun with you. I made my way to Prague to play Legacy and meet my friend Tomáš Vlček before we headed towards to the USA to play in Grand Prix New Jersey and SCG Richmond, which was a success for both of us. I placed 4th at GP NJ and 10th at SCG Richmond, while he placed 11th at GP NJ, and 5th at Richmond. But back to Prague. The event itself was a pleasure to play in, as the venue reminded me of Pro Tour Atlanta. It was outstandingly clean, the bathroom facilities were plentiful, and the building as a whole made a good impression. The Legacy tournament didn’t go too well for me, as I placed 19th out of 144 players, piloting my beloved Miracles deck. By the end of the tournament I talked to Jan Zuskač (aka ZUZY), the organizer of Prague Eternal. He told me that he could in fact get me some pieces of Power which would enable me to play Vintage the next day. There was no way I’d turn down such an amazing opportunity, and I’d like to thank him again for just that! He promised to contact me later that night to reveal which parts of the infamous P9 would be available to me next morning. So we went to dinner with the crew, consisting of Tomáš, myself, and countless Germans that kept complaining about how hungry they were and how far the next restaurant was. All of the places that we went to were either full or closed, leading to a 30+ minute walk through Prague. We returned way past midnight, and as we settled down in Tomáš’ apartment my phone connected to the Wi-Fi and I received the message that ZUZY had the Lotus, Moxen and Recall. All that was missing was basically the Time Walk but I felt confident in finding one of those in the morning. So what would I play in Vintage? I’ve never played this format before, nor did I test it. I knew that BUG Fish was a pretty good deck, as Julian Knab made it to the finals at the last Prague Eternal, but I didn’t really have a list and I also didn’t feel like net-decking. As I only brought my Legacy Miracles deck with me I had no choice, so I sat down, grabbed Tomáš’ trade binders, and started building while the others were already settling down to get some sleep. For BUG the creature base seemed pretty easy to build, and so did most of the spells, but I just couldn’t find the 4th Mental Misstep, so I played 3. For the sideboard I wanted some Flusterstorms, but didn’t find enough, so I split it with Envelop and Dispel. I also felt like trying out Negate, which should be pretty good in a format with a lot of non-creature spells, and as Tomáš didn’t have Mana Drain I put two Negate in my sideboard. 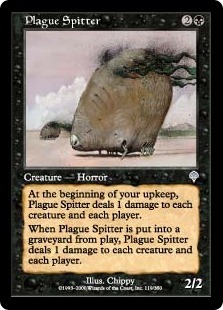 Now for my personal favorite – Plague Spitter. When I was browsing through the binder this card stood out, due to its hilarious art, familiar design, and useful ability. I was kind of forced to include this card. I just couldn’t have played the tournament without it. After I had my deck built it was already past 2am, but I was happy with what I brewed up and couldn’t wait for playing the next day! This is the list, for reference. We stormed to the site on Sunday, ready to play some Vintage! I collected the power from Zuzy, found a Time Walk, and was ready to battle in this format for the first time in real life. I cannot exactly recall all of the games, as this tournament was followed by countless others in different continents, so forgive me. Yet I can still strongly recall many situations from this tournament which I’ll recap below. In the first round I played against a Tezzerator Control build. In the first game I was able to Spell Pierce 4 different important cards by abusing Snapcaster Mage to the fullest. It was pretty amusing as I had thought that Spell Pierce wasn’t that good in this format, and that Flusterstorm would be better. After this I was quite happy that I did in fact include Spell Pierce. The second game had me experience playing against the first Lotus-draw in my real-life Vintage. Long story short, I was pretty dead pretty quickly. In the third game, however, it was me who had the Black Lotus and I smiled, telling everybody who watched how amazingly fun this format is and what they were missing. I obviously excused myself to my opponent as things like this can very often be understood as pretty rude. Well, I started the game with Null Rod and Dark Confidant on Turn 1, followed by an Abrupt Decay and a Snapcaster Mage on literally everything he played. This first match was an amazing start to the format but it was meant to get even better. In one of the next rounds I played against a Tinker based Control deck. In the first game he spent all of his resources to fight against Deathrite Shaman and Dark Confidant, but once he did this he was out of cards and I just tutored for my beautifully altered Jace, the Mind Sculptor, and took the game from there. This one felt like Legacy, to be honest. The second game was a big source of enjoyment on this day. It all started by me getting a pair of Dark Confidants early on, but due to a chain of unfortunate events I only drew Force of Wills from their triggers and lands from my natural draw steps. When he went for Tinker after getting rid of my last Force of Will I cast Envelop. And he had to read it while I couldn’t stop grinning! Yes, sir. Envelop! But the enjoyment didn’t stop there, as I was very likely to die off my three Dark Confidants, already being at very low life thanks to flipping numerous Force of Wills. So I just attacked with all three of them, ready to concede the game as he was on high enough life to take the damage. But my opponent had different plans, he traded 2 Dark Confidants with 2 of his own Dark Confidants, and I didn’t really know what happened. I was about to die but my opponent decides to give me yet another chance. My remaining Confidant revealed Brainstorm, which enabled me to chain cantrips to minimize the negative effect of my Dark Confidant in the following turns. I won shortly after, in a game that I had no business winning. I was in a very good mood, but that would change very soon, as I was facing off against MUD in the next match. The match was over in about 10 minutes. I heard there’s a good reason why Trinisphere is Restricted. Getting blown out by it both games was rather frustrating, and reminded me of the fact that no format is perfect. And by perfect I mean a format with matches that are all on a somewhat even footing without a big influence from the side of variance. I was still looking forward to the next match, which I played against Anton Karlinski, who would later go on to win this tournament. His deck was very similar to mine, but it had one big difference. He played Lightning Bolt instead of Abrupt Decay, and had more Planeswalkers. You can’t apply everything from Legacy to Vintage, but some principles still apply. Having cheaper disruption and more bombs is generally a good thing in the pseudo-mirror. Prior to the match I didn’t know about his inclusion of Lightning Bolts, so I constructed a game state that left him practically dead, with me having Jace, and Dark Confidant. Well, one end of turn Lightning Bolt, followed by yet another ended my dreams pretty quickly. The second game was close until his amusingly unfortunate sequence of ripping Ancestral Recall, followed by Snapcaster Mage, recasting Ancestral Recall. Oh well. But the amazing games weren’t over, and the next round was a blast as well. I played against a gentleman from London, but what I didn’t know at this point was that I was going to meet the very same guy the next weekend in New Jersey at the biggest Legacy Grand Prix in history. Well, in the first game I had little going on and he made a 20/20 Marit Lage. 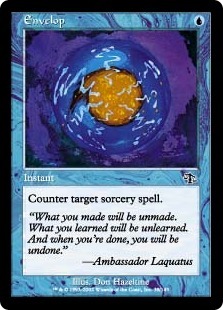 I then tutored for Jace, the Mind Sculptor and bounced it, to which he conceded. I thought that he played some kind of combo deck that evolved around getting Marit Lage in play as fast as possible and cut all the removal spells, while loading up on counter magic, in anticipation of countering his ramp spells or what have you. He started game 2 with a Deathrite Shaman, which was pretty strange, but I had my own. On his second turn he cast a discard Spell, followed by Bitterblossom. I stared at my hand, took a look at my sideboard and conceded. I had literally no way of beating Bitterblossom at this point. A drastic change of sideboard later and I was ready for an attrition match. The third game ended with me having 2 Dark Confidants, Jace, the Mind Sculptor, and Time Walk with Snapcaster Mage in hand. Do you know how this feels? Incredibly overpowered and amazing! I couldn’t stop grinning at that. Earlier I even received a warning due to drawing too few cards, as I resolved my Dark Confidant triggers and went to Jace-Brainstorm shortly after. I won the game with 13 cards in my hand! The last round saw me playing against Titus Chalk, author of “So Do You Wear a Cape?” in yet another pseudo-mirror. He had some delve-based draw spells going on, as well as several copies of Preordain. Due to our suicidal low land counts we both had problems developing our mana. The first game saw me riding Jace, the Mind Sculptor to victory. Game two involved a pretty absurd scenario. I had a Dark Confidant in play when he had a Forest. Then he cast Black Lotus, cracked it for BBB and cast Abrupt Decay on Dark Confidant. That’s fine, right? But then he cast Pack Rat and I was dazzled once again, and yet again I couldn’t stop laughing about how amazing and absurd things were over here in Vintage. Even though I was able to get rid of the Rats in time, I was on the back foot the rest of the game and died with a lot of cards in hand. The third game reached an interesting climax when I resolved my Jace, the Mind Sculptor. He let it resolve, and then Vampiric Tutored on my end of turn. He drew, and cast True-Name Nemesis, and I had to let it resolve. So I drew, and Brainstormed with Jace, drawing Plague Spitter and Engineered Plague. So I revealed Plague Spitter while laughing and telling him how great it would be if this card worked. I still cast Engineered Plague and got rid of his True-Name Nemesis. The outstanding suppressing power of Plague Spitter the next turn forced him to concede the match. Spitter for the win! Due to my good tiebreakers I ended up as the 8th seed, and in the Top 8 in my first Vintage tournament that had me grinning and laughing more often than any other tournament to date. In the Top 8 I played against Jan Zuskač, the organizer and gentleman who lent me the Power. You can watch the game here, and no, it’s not Legacy vs. Vintage, even though it seems that way. Looking back at this tournament I have to say that it was one of the best tournaments that I had played in since I first discovered Legacy. My immense familiarity with Legacy and my continuous success makes everything look so normal. Vintage is just as different as refreshing, even though it’s closer to Legacy as one might initially think. Having to think through all these decisions from the bottom up while not knowing every possible line that your opponent might have is something new for me, and was as enjoyable as it gets. If I ever get the chance to dive into Vintage again, by god, I’ll do so! I hope you enjoyed reading about my first Vintage encounter, and hopefully there will be more to come.